John English became involved in the campaign to ban anti-personnel landmines when he was a Member of Parliament and, in the summer and fall of 1997, a special ambassador promoting the proposed treaty. He is a distinguished professor emeritus at the University of Waterloo and is currently director of The Bill Graham Centre for Contemporary International History at the University of Toronto where he is also a Distinguished Senior Fellow at the Munk School of Global Affairs. 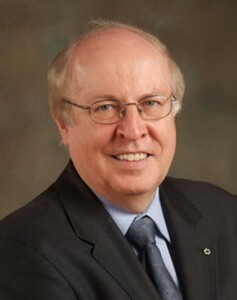 He has written several books on Canadian history and has served as president of the Canadian Institute of International Affairs and as chair of the Canadian Museum of Civilization. He is a Member of the Order of Canada, a Fellow of the Royal Society of Canada and holds the Cross of the Order of Merit of the Federal Republic of Germany. "The landmine cannot tell the difference between a soldier or a civilian - a woman, a child, a grandmother going out to collect firewood to make the family meal… once peace is declared the landmine does not recognize that peace. The landmine is eternally prepared to take victims."